Well blow me down! Varèse Sarabande will release the most comprehensive version of the Popeye soundtrack ever assembled, featuring the film’s beloved songs by Harry Nilsson, performed by the cast (including Robin Williams, Shelly Duvall, and Ray Walston), never-before released original score composed by Thomas Pierson, and an entire disc of demos performed by Harry Nilsson. The POPEYE – Deluxe Edition Music From the Motion Picture, which also includes newly-discovered images and extensive liner notes, will be released digitally and on CD on September 29, 2017. 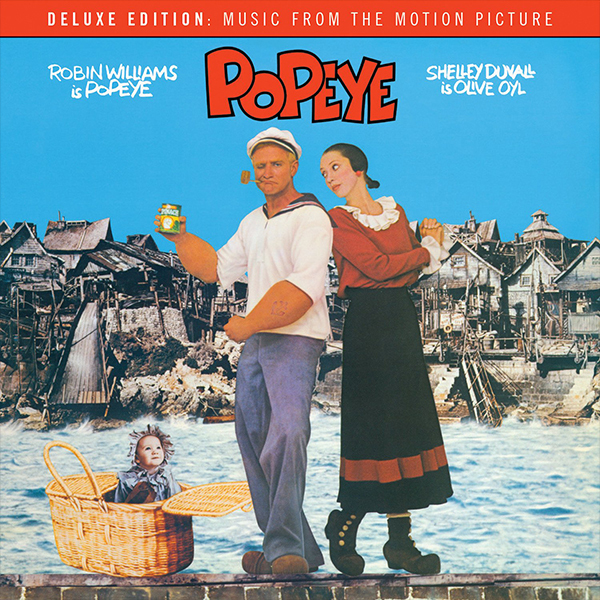 Looking for the father (Ray Walston) who deserted him as a baby, a sailor named Popeye (Robin Williams) journeys to the port town of Sweethaven. Popeye befriends an assortment of eccentrics and falls in love with Olive Oyl (Shelley Duvall), who already has a suitor, the bully Bluto (Paul L. Smith). Popeye also discovers an abandoned baby, Swee'Pea, whom he raises as his own. But when the spurned Bluto kidnaps Olive and the child, Popeye takes action, with the help of his magic spinach…. Eventually though he came on board – though the team at Paramount still needed convincing. In May 1979 Nilsson was given three weeks to write three songs for the film. He would present home demos for the tracks “He Needs Me,” “I’m Mean,” “Swee’Pea’s Lullaby,” amongst other. For the first time available digitally and on CD, Varèse Sarabande has compiled the original soundtrack recordings, original score by Pierson, and the demo recordings performed by Harry Nilsson for the Popeye - Deluxe Edition: Music from the Motion Picture two-disc set.